[Phillip Torrone] from Make recently sat down with [Jean-Pierre Mandon] and [Tsvetan Usunov], creators of the Pinguino, to hear more about their product. While the name might not sound familiar, we’re pretty sure you’ll be seeing more of this development platform as time goes on. 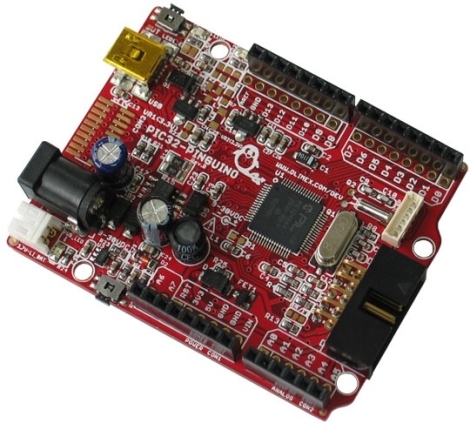 Essentially created by makers for makers, the Pinguino is a 32-bit PIC based Arduino-compatible prototyping platform, much like Microchip’s chipKIT. The Pinguino boasts 100% Arduino compatibility just as the chipKIT, though their tool chain has been built from scratch, meaning it is completely open source. The Pinguino even include an on-board microSD slot and a built-in Li-Po charger – two huge features that make this a solid chipKit competitor. Phil discusses the history of the Pinguino with the pair, diving into technical differences between the two platforms, as well as where they plan on taking the platform in the future. It’s certainly an interesting read for anyone interested in open software and hardware that has been considering giving the chipKIT a try.